It's not a comfortable discussion for everyone, but Judith Ursitti has no problems talking about her family's decision to become brain donors for autism research. The Ursittis have registered with Autism BrainNet, which seeks to unravel the mysteries of autism by studying the postmortem brains of people who do and don't have the condition. Why Register for Brain research? Her journey to that decision started a decade ago, with news that took her completely by surprise. Her son, Jack was diagnosed with autism just after his second birthday. "I was totally gobsmacked. I missed the red flags. I really didn't know and didn't catch the signs of autism," she recalled. At the time, she was a tax accountant living in Texas with husband, Andy, and children Amy and Jack. Autism simply wasn't on their radar screen. She had to learn about autism quickly. "Jack needed really intensive early intervention to help him because he tested on the more severe end of the autism spectrum," she explained. "We had a caring pediatrician who described the evidence-based treatment and referred Jack to early intervention." Unfortunately, it wouldn't be that simple. Their medical insurance would not cover speech and language therapy, or the Applied Behavior Analysis (ABA) therapy that the doctor recommended. The Ursittis went to their county's Early Intervention program. Unfortunately, Jack was offered "essentially nothing," just one hour of speech therapy a month, his mother said. It was 2005. Autism awareness was already high across the United States, and the Ursittis were living in a high-performing school district in the Dallas-Fort Worth area. But none of that seemed to matter. "When it comes to special education, just because you live in a high-achieving school district, it doesn't necessarily lead to meaningful services for special education." The Ursittis believed they didn't have time to waste. "We ended up paying out-of-pocket for interventions for him, but the quality of the services we could get wasn't great," she said. "We really paid a lot of money for mediocre services for him." Many families cannot afford to pay for therapies themselves, so Ms. Ursitti joined with other parents to lobby the Texas state legislature to pass a law requiring medical insurance plans to cover therapies for autism. They won in 2007. "That was huge," she recalled. Her husband, also an accountant, transferred to a job in Boston when Jack was four. Although it meant leaving her home state, "moving to Boston was a home run for Jack. The services up here are fantastic; it was like moving to a different world." As a parent-advocate, it was eye-opening. "People truly don't understand the lack of services that exist in some places. There are many children and adults who receive next to no services, despite federal law, and it's all based on the state in which they live." Around that time, the national Autism Speaks organization hired her as part of a team to lobby for autism insurance legislation in other states. In the nine years since then, 45 states have passed such legislation. 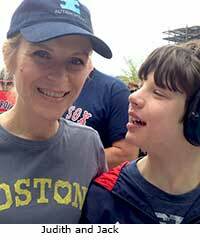 Jack received better services in Massachusetts, including ABA therapy. Now 13, Jack attends a school for students with autism, and uses a program on his iPad mobile device to communicate. "He's still severely affected by autism, with a different path," his mother said. He has struggled with some behaviors common to autism, such as running away, that make keeping him safe a challenge. As Ms. Ursitti sees it, there's still much we don't know about autism spectrum disorder (ASD). When she learned about Autism BrainNet, she didn't hesitate to register. "I was shocked at the limited research we've been able to do on the human brain. When I learned that brains were needed in order to do meaningful research, and I learned that brains weren't utilized when people donate organs, I was just motivated to do something. I really want to know what autism is. I know there are lots of really strong scientific theories," she said. Brain scans using Magnetic Resonance Imaging (MRI) and other techniques, while valuable, can only take science so far in understanding the genetic and cell differences in the brain tissue of people with autism. "A researcher has explained that looking at brain tissue with an MRI is like looking at the moon through a telescope. You're too far away to see many important details," explained Carol B. Koch, former director of special projects at the Autism Science Foundation. That foundation, a nonprofit that funds research, helped launch Autism BrainNet. Without actually examining postmortem brain tissue, scientists cannot know what is happening at the level of genes, molecules, and cells. David G. Amaral, PhD, of the MIND Institute at University of California-Davis, explained why, in a webinar for the Interactive Autism Network.1 The core feature of autism is "abnormal processing of the brain," he said. "Unfortunately, at this point, it's still unclear what aspects of brain function have been altered and the only way in fact we can understand these alterations in brain function is to study the organ most impacted, which is the brain." When people register with Autism BrainNet, they are under no obligation to make a donation. However, registering does make it much easier to donate after a death. The program includes Dr. Amaral's MIND Institute in Sacramento, along with the Icahn School of Medicine at Mount Sinai in New York, University of Texas Southwestern Medical School in Dallas, and Harvard University/Beth Israel Deaconess Medical Center in Boston. Autism BrainNet encourages donations from people with autism, their relatives, and others with no connection to ASD. The program is funded by the Simons Foundation, which provides grants for scientific and mathematical research. The Autism Research Institute, Autism Speaks, and the Autism Science Foundation have all lent their support. The scientific need for tissue to study convinced Ms. Ursitti. "The minute I found out about it, I signed myself up, I signed Jack up and my family up. I told everyone I knew, 'Please, we need your brain.' What I want to do is provide meaningful services to people. Without really knowing the biology of autism, you can't access meaningful treatments." She became a cheerleader for the program; her family even appears in Superhero capes in a public service announcement for Autism BrainNet. Don't some people find the topic uncomfortable? "With those folks, I don't think I'm going to change their mind, and I move on," Ms. Ursitti said. "But for so many families, brain donation doesn't occur to them, so it's important to make them aware of this and how easy it is to do this." Researchers have examined why people chose to donate organs to be transplanted in others,2 as well as for medical research.3 They found that some people find the topic unsettling or unappealing, for a variety of personal, cultural, religious, or family reasons. "I personally didn't think twice about registering with Autism BrainNet," Ms. Koch said, "but on an emotional level, I can understand that some people may have some initial reluctance." She and her adult son have both registered. Ms. Ursitti had another reason to register with Autism BrainNet. In her role as state government affairs director for Autism Speaks, she meets many families affected by autism across the country. A few of those parents have lost children with severe autism, sometimes for medical reasons that are not fully understood, she said. There was one mother whose son went to bed on Thanksgiving and didn't wake up the next morning. "He hadn't had a seizure in years," Ms. Ursitti recalled. These losses may be rare, compared to the large number of people with ASD, but they're still far, far too high. "If we can figure out the biology of autism and learn what's causing children to have impulsive behaviors, to bolt, and we can learn what's happening in the brain overnight, we can solve this. There's so much angst over the causes of autism, and parents are never going to be at peace until science has access to brain tissue." 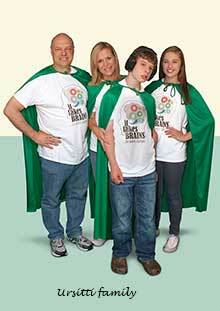 To learn more about Autism BrainNet, please visit takesbrains.org or call 877-333-0999. Researchers should visit https://autismbrainnet.org for information specific to them. To learn about scientific breakthroughs made possible through the study of brain tissue, please see Dr. Amaral's article for the Interactive Autism Network (IAN), Five Ways in Which Postmortem Brain Tissue has Helped Researchers Understand Autism Spectrum Disorder. How does the Autism Brain Change through the Lifespan? How is the Female Autism Brain Different? 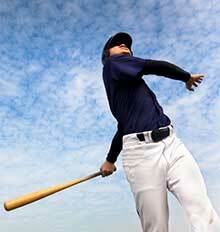 Photo credits: Judith and Jack Ursitti/Judith Ursitti; baseball player/iStock, Ursitti family/Foundation Associates, LLC. Amaral DG. Simons Simplex Community@Interactive Autism Network video, Webinar on Autism and Brain Research. 2015. Accessed Feb 28, 2017. Exley M, White N, Martin JH. Why families say no to organ donation. Crit Care Nurse. 2002;22(6):44-51. Abstract. Boise L, Hinton L, Rosen HJ, Ruhl M. Will my soul go to heaven if they take my brain? Beliefs and worries about brain donation among four ethnic groups. Gerontologist. 2016 Mar 2. pii: gnv683. Abstract. Foundation Associates LLC. Questions and Answers. https://takesbrains.org/qa/. Accessed Feb 28, 2017.